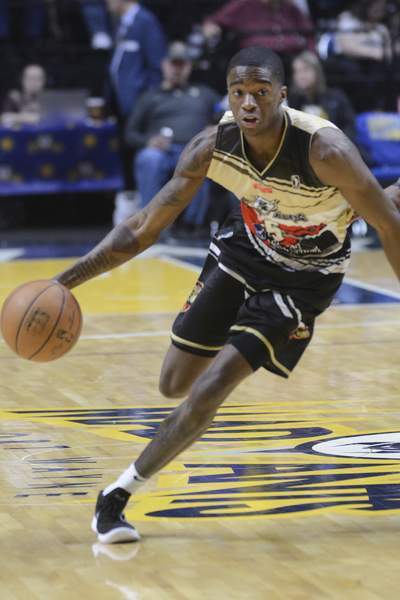 Brett Luke | The Journal Gazette Mad Ants guard Edmond Sumner drives up the court during the second quarter against the Windy City Bulls Friday night at the Coliseum. The G League playoffs will be single-elimination until the finals and the Mad Ants did themselves a big favor by taking the first round out of the equation. Their 119-107 victory tonight over the Windy City Bulls clinched them the Central Division title and ensured them enough breathing room over whoever wins the Southeast Division that they’ll have the second seed in the conference. That means Fort Wayne will get a bye until the second round, during which it will host a winner-moves-on game at Memorial Coliseum. The playoff game will be March 31 at the Coliseum at 12:30 p.m., and tickets are on sale at the box office, though the Mad Ants still have one more regular-season game, Saturday at Erie, Pennsylvania, to get ready for the postseason. Had the Mad Ants not taken care of matters tonight, that game might have had serious implications, since the BayHawks are vying for the Southeast Division title with the Lakeland Magic. Leading Fort Wayne (29-20) tonight was DeQuan Jones with 28 points. Walt Lemon Jr. had 22 points, 13 rebounds and nine assists. Windy City (23-26) was paced by Mychal Mulder’s 26 points. Grand Rapids, in second place in the Central Division, wasn’t making things easy on Fort Wayne. It defeated Greensboro for a fifth straight victory tonight. The first 1,000 fans at the Coliseum received Ron Howard bobbleheads, celebrating the now-retired franchise great who had his No. 19 retired last season for contributions that included a Co-MVP award, becoming the league’s leading scorer for a time and captaining Fort Wayne to the 2014 championship. It was the first meeting since the Mad Ants traded C.J. Fair to the Bulls on Feb. 12 for Duje Dukan, who has played sparingly in the 13 games since, and the rights to Henry Sims. Fair, who had underperformed in averaging 9.8 points, 3.7 rebounds and 1.4 assists in 33 games with Fort Wayne this season, came into tonight averaging 11.6 points, 5.9 rebounds and 2.2 assists in 12 games with Windy City. Fair had six points and six rebounds tonight. The Mad Ants opened the game with a 14-4 run, culminating with a Jones 3-point play, and their lead was up to a commanding 28-10 when Trey McKinney Jones converted a shot from beyond the arc with 3:19 left in the first quarter. The Bulls soon made a run, though, and got within six when Alex Hamilton’s layup cut Fort Wayne’s lead to 43-37 with 6:16 left in the second quarter. The Mad Ants shot 51.4 percent in the first half, en route to a 59-46 lead, while the Bulls were at only 36 percent. Edmond Sumner’s drive, during which he fought physical Hamilton defense, resulted in a dish to Ben Moore for a layup and a 74-60 lead with 5:08 left in the third quarter. But the Mad Ants were up only 84-79 at the end of the quarter. Back-to-back Lemon drives put the Mad Ants up 95-81 with 9:03 left in the fourth. Notes: Breanna Doughman, who has a rare neurological disorder, Rett Syndrome, and is confined to a wheelchair, has been a member of the Madame Ants dance team for three years. She practices with them and participates in home games, accompanied by her mother, Kricket. They received a standing ovation during a first-quarter ceremony, as did Stoops Freightliner’s Jim Ham, Charlie Maroney and Dale Walker, who designed and built Breanna a new electric wheelchair.